PLANT PICKET’s unique patented design was originally created from cut-offs of reclaimed redwood purchased from an online auction site for a furniture refurbishing project. Conceived of by an avid gardener and furniture designer, the unique garden marker was designed to stand up to the elements year round as well as complement the garden. PLANT PICKET wishes to represent your garden, and show your seedlings what they will be when they grow up. Standing proud, indoors or out, rain or shine, sleet or snow. Regardless of the weather, PLANT PICKET will stick up for your garden. Design ideas? We love them. Tell us your suggestions for PLANT PICKET, and we’ll add them to the collection. 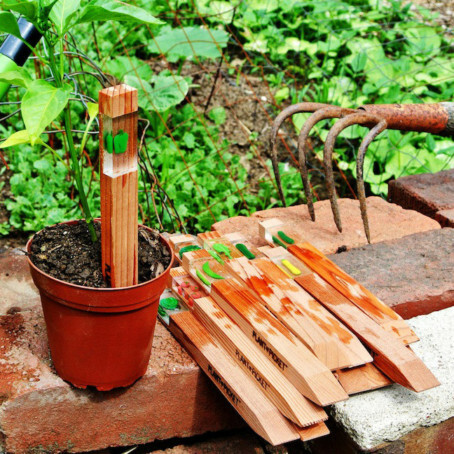 PLANT PICKET is excited to grow with your garden.